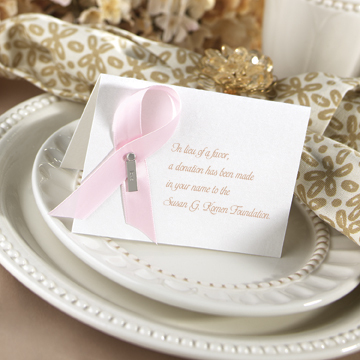 "In lieu of favors" is an idea that traditionally entails of the bride and groom making a charitable donation on behalf of their guests in place of choosing to present their guests with a physical favour on the day of the ceremony. 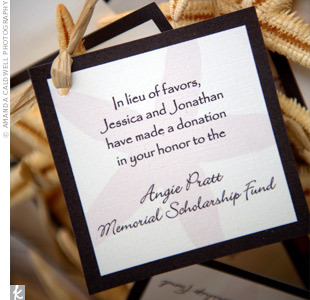 "In lieu of favors" is an ample idea leaving the bride and groom with the freedom to choose a charity which is close to their hearts and on some occasions the option to choose more than one meaningful charity to donate to. Here are some simple guidelines which are notable to abide by when choosing to opt for in lieu of favors on your special day. 2) Sometimes it is best not to do cards for every table or every place setting or whatever. If you want to announce it, perhaps it is better to do so with some discretion and place a sign in an area of high traffic on the day like cake table or guest book table. 3) Don't do a favor on top of the donation that is themed to it, even if given out by the charity. However sometimes it is admirable to do both a small favour with a tag detailing about the donation made to the particular charity. 4)Do your best to ensure that it is not a controversial charity organization that some people at the wedding may be opposed to as this may create an unhealthy table time discussion at the reception! All in all "in lieu of favors" is a pleasant way to donate to a charity which is close to your heart and leaves you with a securing sense of doing something charitable and worthwhile on your special day.